Peoples having a web site or blog or even a good e-commerce website are interested in the details and stats of the visitors of their sites. Bloggers and webmasters always want to monitor the site visitors that come from search engines and also from other different sources. Web analytics is very important to check competitor’s web traffic too. In this article I am going to tell you about the free web analytics, online tools that you can use for all above purposes. If you properly use Web analytics tools, then it will help you to write better and suitable content for your visitors. To using these online tools, you will not have to download them. You can use these tools freely online by making an account only. Web analytics tools are those tools that provide all information about you blog visitors and readers. They tell you about the number of visitors that you are getting on your site. These tools also provide you the sources from where the visitors land on your blog or website. You can check which or your content and article is getting the most web traffic and from where the traffic is coming. These tools help you to understand the behaviour of your visitors and real-time visitor tracking is also available in them. Listed below are the Helpful and totally free Web Stats Monitoring tools with various abilities to help you in examining your site visitors. They will surely help you to understand your web traffic. Have a look at them! Google Analytics (GA) is a very efficient and free website traffic analysis tool. It is the most commonly used by bloggers. It gives almost all details about visitors like, real time tracking, country location etc. You can also understand your search engine traffic by finding the keywords of your site. It is a full analytics package for small websites and blogs. It also gives real time tracking of visitors. Yahoo! Web Analytics is an awesome tool for big websites and systems for traffic tracking. It is very much easy to use and to implement. Update: It’s been retired. This tool is best to analyze search engine traffic. You can find out information about the landing pages of your visitors and also their location and country. Google webmaster tools is best for understanding the behavior of your visitors and tracking your search engine traffic. It also gives you the analysis report of the traffic that is coming from search engines. You can check the indexing and crawling status of your site using this tool. You can use sitemeter for web analytics. It gives a counter for real time traffic on your site. CrazyEgg makes a heatmap of your visitors so that you can find about the clicks and visits of your readers to different parts of your site. Gostats is a reliable and understandable for tool for web traffic analytics. It is a web analytics tool that provides information about the keywords that your visitors used in search engines. It also helps in SEO of your site by understanding the search traffic. Update: it’s been retired. Histats.com is a free web analytics tools with a real-time analysis of web site traffic. It is an easy to use and simple to understand we analytic tool for web masters. For using his tool, no account registration is needed and you can just implement the code on your site to track your real time visitors. StatCounter is a free web traffic analytic service which provides free hit counters, visitor tracking, etc. The best things about this tool which makes it different from other web analytics tools is that it helps you to Compete with other sites by giving you details on unique visitors, referring sites sources and search engines keywords terms. Open Site Explorer provides information about link popularity backlink analysis of your site. Does Web Analytics Tools Help? I have tried to provide here updated, working and free web analytics online tools. You can try them all and select the best one which you like the most. Make sure to give your feedback about this post and also let us know if you are using any better tool that we have missed here. We will be thankful to you. Subscribe to get latest free online tools in your inbox. Share this post with your friends on your favourite social networks. Comments related to this post are appreciated. If you've another online tool and want to share, you can do so. Please do not use anchor tags while inserting links. I'm glad to hear than it was useful for you. You Most welcome. Looking forward to hear from you. I would recommend to check out Zoom Analytics. They have both web analytics and inbound marketing in the same product. Also available free plan. Thank you for commenting and sharing your views. Zoom Analytics is a Brand New. It's good that it has a Free Plan, I'd recommend it to the readers of my Blog. Thank you for suggesting another web analytics tool for our readers. A good one, I have another web analytics tool to recommend: http://miapex.com a tool combined GA with heatmaps suite. 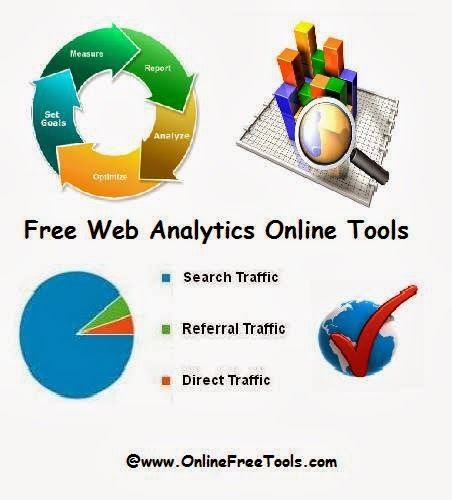 Thank you for commenting and recommending another free online web analytic tool. contact me if you'd like to publish an exclusive review about it.